Dresden, Germany – 27 November 2014 – DSM Dyneema announced today that it has won three ITMA Future Materials awards based on its breakthrough Dyneema® Force Multiplier Technology platform. Future Materials honored DSM Dyneema, the manufacturer of ultra high molecular weight polyethylene (UHMwPE) fiber, branded as Dyneema®, and a world leader in life protection materials and high-performance fibers, with awards for Best Innovation – Industrial Textiles; Most Innovative Large Company; and Launch of the Year. The awards were presented to DSM Dyneema’s Yvonne Engelen, vice president marketing and sales, and Shitij Chabba, global segment director life protection, at an awards ceremony in Dresden, Germany, on Nov. 26. These awards collectively recognize the exceptional innovation and success of the Dyneema® Force Multiplier platform, which was launched in 2013 as the culmination of an intensive, 30-month research and development initiative. As a DSM Dyneema Radical Innovation, Dyneema® Force Multiplier Technology is enabling development of textiles for game-changing life protection and industrial applications, including soft body armor, hard materials for helmets, vest inserts and vehicle protection. This platform delivers exceptional ballistic performance and the lightest weight and lowest profile for armor applications. 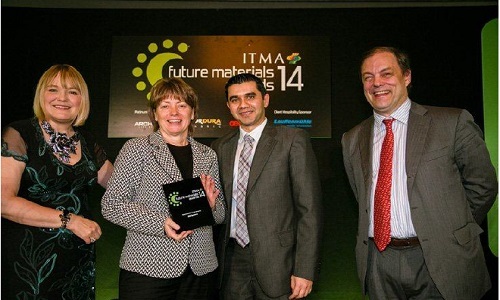 As publishers of Future Materials magazine, World Textile Information Network (WTiN) launched the Future Materials Awards to reward innovation in the highly competitive technical textiles market.